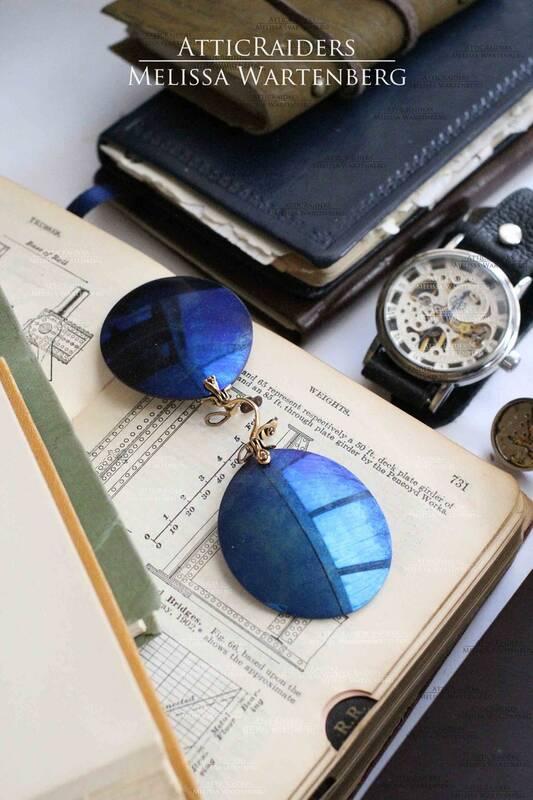 Pinch on these restored vintage blue 1920s steampunk sunglasses and wear them with any outfit. A roguishly striking travel accessory made for someone with a handsome taste in fine accessories. Roughly dated to have been originally made during the roaring twenties, these gold and blue sunglasses were cleaned and polished to bring them back to a like-new condition. Metal grip nose pads with their original vintage plastic pads firmly affix to the nose bridge and the sun rated UVA/UVB blue polarized oval lenses complete the piece. 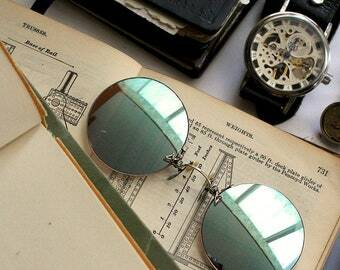 A unique eyewear accessory that's lightweight and easy to take with you wherever your curiosity may bring you. Did you know? The Shuron optics company has been making optical devices since 1865! A well established company for making quality eyewear , the nose bridge used to make this pair of sunglasses is made with a marked Shuron piece and confirmed by the stamp on it that it's 10 karat gold filled. Practical and luxurious! The nose piece is made using a very small spring that's wrapped and looped around two small arms that connect to the nose pads, a pince nez style of nose bridge can date back as far back as the early 1800s but the presence of vintage plastic nose pads on the metal feet indicates that this particular nose piece was made during the 20's; one of histories peaks of glamorous parties, elegant fashion and extravagant accessories. A piece thats seen a lifetime of use is now ready for another lifetime of enjoyment and to keep these sunglasses in great shape select from the options available which case type you would like to pair with this item. After all - fashion may come and go but style is forever. ~ prescription lenses are not available through AtticRaiders. 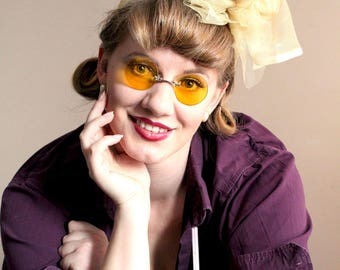 ~ these frames can be fitted with your prescription by your optometrist. 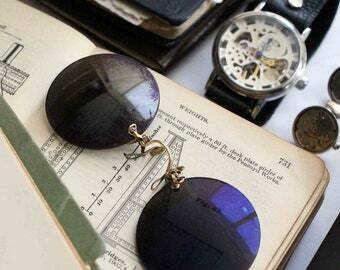 Please ask your local optometrist for details about fitting lenses for vintage frames. Copyright © 2009-2018 and beyond belongs solely to AtticRaiders. The content herein, including but not limited to, all intellectual property, designs, materials and the selection and placement thereof in such designs, copy, text, photography, listing format and content is the sole and exclusive right of AtticRaiders and its subsidiaries and any attempt to copy or reproduce any of such designs, copy, text or content, by any means, electronic, manually, visually or otherwise is prohibited by law and all infringements, intentional or otherwise, shall be prosecuted to the full extent of the law.